Eczema, or dermatitis is a term used to describe inflammatory diseases of the skin. It is composed of many variable clinical and histological findings and is the final common expression for a number of disorders which include atopic dermatitis, allergic contact and irritant contact dermatitis, dyshidrotic eczema, nummular eczema, lichen simplex chronicus, asteatotic eczema, and seborrheic dermatitis. Depending on the causes and type of dermatitis symptoms can arise acutely (hours) or subacutely (days). Primary lesions (the disease appearance at the very start) may include papules, erythematous macules, and vesicles, which can coalesce to form blisters, patches and plaques. This is usually associated with intense itching (pruritus). In severe eczema, secondary lesions (the disease appearance later on) from infection or excoriation, marked by weeping and crusting, may predominate. 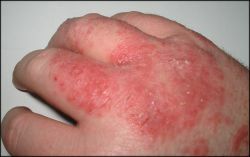 Long-standing (chronic) dermatitis is often dry and is characterized by thickened, scaling skin (lichenification). This usually results from repetitive itching in subacute cases. It is important to identify any possible contact allergens as well as the type of dermatitis (see above). For acute cases treatment consists of frequent cool wet dressings, oral corticosteroids to control the inflammation. Antihistamines are given to control the itching. Co-existing infection can be treated with oral antibiotics. Subacute cases can be treated with topical corticosteroids, emollients for dry skin, antihistamines for pruritus and oral antibiotics for those with infection. Coal tar agents can be used in cases that are resistant to treatment. Chronic cases are treated using topical corticosteroids. Some cases that do not respond may require intralesional steroid injections. Emollients are used to treat the dry skin.